← Nitpicking the Hits: Jennifer Lopez and Pitbull want everyone “On the Floor”–especially you, Dale! I had recently purchased a mandolin when I joined 60,000 swarthy music fans jammed into Chicago’s Grant Park for Lollapalooza 2006. In the morning on day three, I headed straight for the stage on the northeast corner of the festival grounds, dug in and prepared for seven hours of immobility so that I could be in the front row when Wilco played in the late afternoon. I was there, pinned against the front fencing, when Nickel Creek took the stage, close enough to see everything Chris Thile was doing with his mandolin. The notes poured out of the instrument like butter—10 times clearer, cleaner, warmer and faster than normal human coordination ought to be capable of producing. I am only slightly exaggerating when I say it was like that agonizing moment in “Amadeus” when Saliari finds himself confronted with his own mediocrity. I could practice my mandolin for eight hours a day for years and never come close to the sound Thile was conjuring out of that damn thing. It was then that I vowed to destroy him. No, I’m kidding. What really happened is I became a big Nickel Creek fan, and I was disappointed when the band announced a few weeks later that the trio was going on hiatus following a farewell tour. 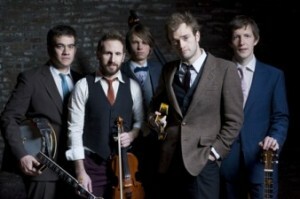 Luckily, Thile has continued to dazzle and explore the progressive frontiers of bluegrass with his new group, Punch Brothers. I haven’t yet seen them live, but judging from recordings and videos, Thile has managed to find four musicians who easily keep pace with his virtuosity, particularly in the case of Noam Pikelny’s consistently surprising, innovative banjo work. When: 9 p.m. today (March 18). When: 9 p.m. Saturday (March 19). Doors open at 8 p.m. This entry was posted in Bay Area Music, Music, Worthy of a Shout-Out and tagged bluegrass, Chris Thile, Great American Music Hall, Mystic Theatre, Nickel Creek, Punch Brothers. Bookmark the permalink.